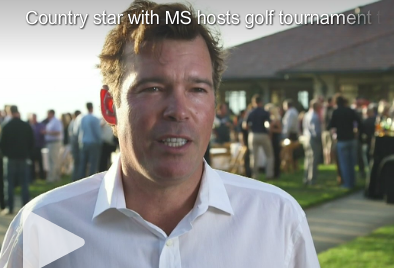 Country music star Clay Walker has hosted a charity golf tournament for the past eight years in California to raise funds in the fight against multiple sclerosis. He has a very personal reason for working to find a cure for the disease. “When I was first diagnosed in 1996, I was told that I would be in a wheelchair in four years and that I would be dead in 8,” Walker said. Walker’s friends from Tennessee, Texas, California and far beyond head to Pebble Beach, Califorina, in early summer for his annual Clay Walker Charity Classic. “It is important for me to find a cure for MS. I have had it for 20 years and have been completely relapse free for 17 straight years. That is because of research done before my time,” he said. For Walker and his friends, the tournament is an excuse to raise money and have a great time at a one of a kind location. Walker’s Band Against MS organization has raised $4.4 million since its inception in 2003. He told News 2 he knows he is lucky and is proud to be an example of hope for others dealing with MS, a disease without a cure but not without hope. “To still be able to sing and still be able to move around knowing that when I was diagnosed, I was given no chance, and I am saying there is always a chance,” he said. Click here for more information about Clay Walker’s Band Against MS.